While sitting in the living room last weekend, I looked over at a chair I bought two of off of Craigslist for $40 a few years ago. I have had every intention of trying to reupholster the pair myself, or get them reupholstered, but have yet to take the leap. No one really sits in the chair, save for Mollie and the occasional guest (who then looks like Mollie when they get up due to her ridiculous proclivity to shed). What I realized while looking at it is that I don't even really like the chair. Covering it in a pretty fabric would only make me like it a little more. 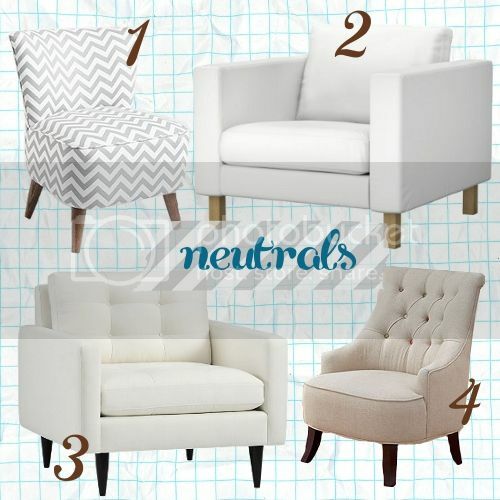 The lines are just not what I like in furniture. 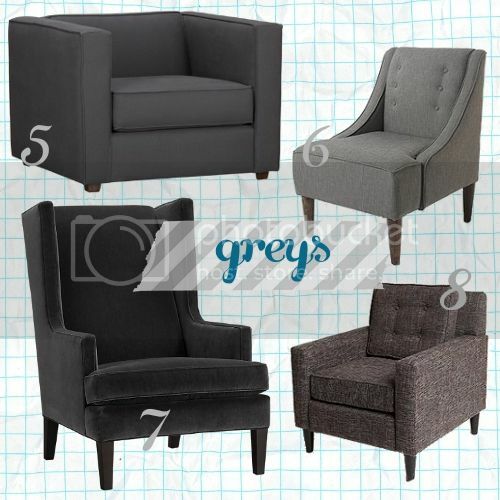 So, of course, I took this as a reason to go looking for chairs that fit my delicate design sensibilities. Why spend hundreds on getting a chair reupholstered only to turn around and want a new one anyway? Silly Mandy. There might also be room in the bedroom for a reading area, which might just necessitate the purchase of more than one of these handsome friends. I love chairs. We never seem to have any because our couch is so huge and we currently live in a rental and half our stuff lives in a storage unit in Phoenix. 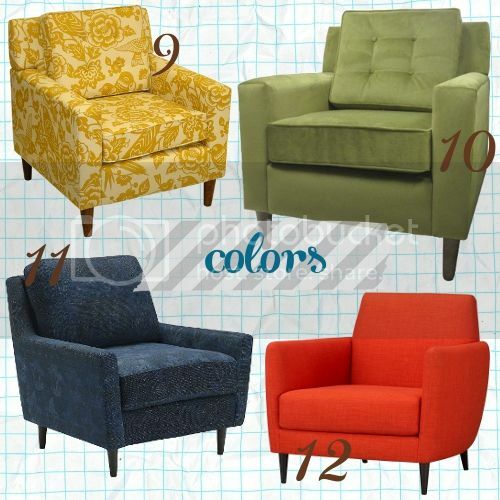 I really love #1 and all the colored chairs. I'm a big fan of color. Rachel-I think I'd have a house full of chairs were they not so expensive. Perhaps I can open a coffee shop someday and then BUY ALL THE CHAIRS! Brandi-You've got excellent taste, my friend, and I am with you on the square aesthetic.